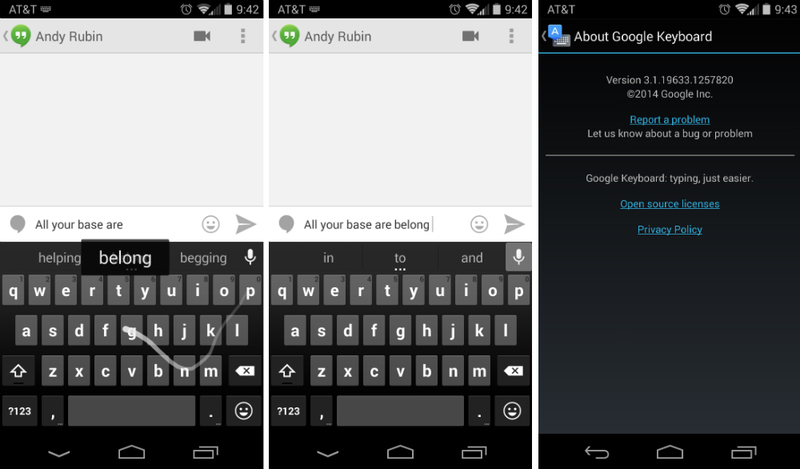 An update to the official Google Keyboard for Android devices is rolling out on Google Play, which might not bring as much as you would hope. At first, we had our fingers crossed that it included the new Material Design theme that is showcased in the Android L developer preview, but now that we have it loaded up on our phones, we can confirm that version 3.1.19 does not include any Material love. Instead, there does not appear to be too much included in the update. The only change staring us in the face is the movement of the Voice Input key. Previously, it was located next to the space bar, but after the update, it is placed in the suggestions box on the right side. This is actually a very nice fix, which should lead to no more accidental taps on the voice input. The download is slowly rolling out over Google Play, but of course, we have a download link available for anyone who wants it.